This column is dedicated to introducing you to the concept of Stewardship. Stewardship takes on many forms; Time, Family, Faith, Talent, Prayer and Treasure. In the previous post in this series, I described stewardship as it relates to our time. 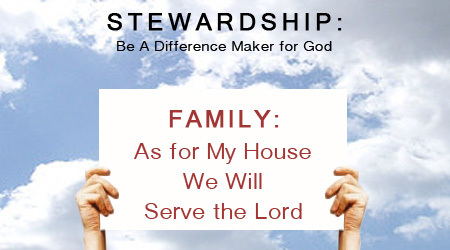 In this post, I would like to introduce you to the concept of Stewardship of Family. I would like to write about two of these areas, time together and supporting one another. The first one, time together, means just that, spending time together with no distractions, no cell phones, no TV and no Internet. It is hard to do with a culture so inundated with distractions, but it is important. I know one family with teens that has a “no texting” policy in their car. That way, the teens and their parents can have focused conversations, without distractions. Time together can also be accomplished by volunteering in the community. What better way to demonstrate compassion than to help the elderly or the homeless together as a family? What is especially inspiring is when we hear stories of employees’ families who support other employees’ families in times of need. This is done not in a formal way, but out of concern for another employee’s situation. Families helping families — what a wonderful way to share your family’s kindness. The second area, supporting one another, can easily be accomplished by sharing household responsibilities. Shared responsibilities means that no job or household chore is restricted to parents or children. In order for a family to operate, it needs teamwork, which means that everyone pitches in, using their unique talents to help better the family. Children should not rely solely on the parents to do everything, and neither should parents rely solely on their children to carry the burdens of managing the household. It is so encouraging when we experience a family where each member feels it contributes to the good of the whole. A good example would be a family where the smaller children set the table, the teens help with dishes or cleaning, and the parents show their appreciation for this. Living in Lancaster County has exposed me to the plain life of Amish and Mennonite people. When you spend time with a plain family, you quickly realize that the family functions are interdependent, all the way down to the four- and five-year-olds. Each family member has responsibilities, chores, and oftentimes if a chore is missed, it could result in a late meal or spoiled crops! One aspect of helping to be a good Steward of your family is to instill a motto, a word, or a saying that can help guide the family though difficult times. A few years ago we had a series at church that was based solely on the word, “Others.” The organization of this series stemmed from one family’s experience with the word. You see, this word was so important for one family; it was the one word that was passed on to each new generation. In my family I use the three words, “God, Family, Education,” to try to keep us focused on what is important. In closing, it is important to note that families almost always default to stewardship behavior because it is natural behavior, and most family members want to support each other. It is important to know how your family relates to these forms of Family Stewardship and in what areas your family is strong and what areas need work. It is important that we all feel we contribute together with uplifting attitudes and, most important, with purpose and good intentions for our families. Please help our community of readers by sharing experiences that you have had in your attempt to be a good Steward of your family. We appreciate your comments.